In the wake of Leonard Nimoy's death, a number of Canadians have taken to the practice of converting the portrait of Prime Minister Sir Wilfred Laurier on the Canadian $5 bill into the iconic image of Mr. Spock. According to the Bank of Canada, defacing bills is not illegal — but it's not without consequences. Social media sites were abuzz last week with people posting images of their Spocked Fives. 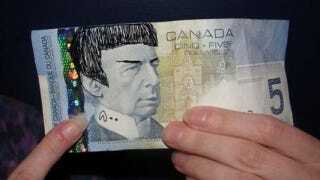 Canadians have been doing this for years, but Nimoy's passing quickly rekindled the practice (at least for those who could find an old $5 bill, that is). Contrary to what many people believe, however, it's not against the law. The Bank of Canada says it's not illegal to deface or mutilate banknotes, but says there are laws prohibiting the reproduction of both sides of a current bill electronically. That said, and as bank spokesperson Josianne Menard told the CBC: "The Bank of Canada feels that writing and markings on bank notes are inappropriate as they are a symbol of our country and a source of national pride." What's more, defaced notes may not circulate for very long, and they're often rejected by retailers. It's also worth pointing out that this practice may not be able to continue for very much longer owing to the new $5 note. Not only is the new bill made from polymer, but there's a different image of Laurier on the bill. But I'm fairly certain someone will find a way to Vulcanize this new depiction of Laurier.